Hope has been absolutely wonderful these past two weeks, she is the smartest and sweetest horse I have ever worked with. 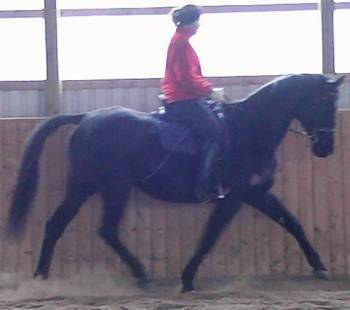 She is just great, she is now going walk, trot, canter and trot poles under saddle. 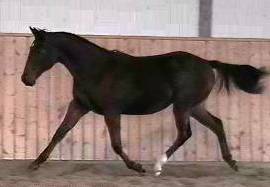 I have also free jumped her once and she shows a lot of potential as a large pony hunter. I am so glad I bought her, she has been perfect. She has been so good that I invited one of my friends from showing out to give her a try. As we were tacking up, somebody got in a car accident across the road, we decided that we would ride her anyway and see how she would react to the commotion, she was great. Helicoptors, ambulances, police and fire trucks all came with sirens and flashing lights. Hope couldn't have cared less. She is showing unbelievable talent and potential. Thank you for starting her right, she has excellent ground manners and has total trust in people, and I know that is from you, it has made my time with her so much easier. I will keep you informed as her training develops. It's funny you contacted me today- I was saying to Eddo this morning, as I watched him ride Levon- "I wish Petra could see how well he is going." Levon is really doing well- confident, happy in his work, we are getting him very relaxed and lifting and swinging through his back- it's wonderful. 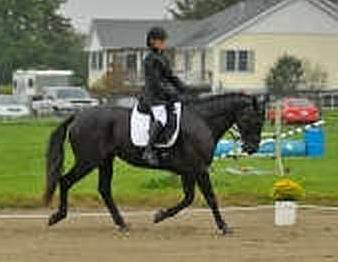 His gaits are much better than we first thought. It's exciting to see all the potential. He is so lovely. I adore him, and he loves me- gets quite jealous at times. He is looking very good, more handsome everyday. It might surprise you to hear that he has turned into a bit of a bully in the yard- nothing bad, but he gets what he wants when he wants (mostly the hay pile of his choice), and he LOVES the mare he goes out with. She loves him too- at certain times of the month. I am very happy with him, and he seems very pleased with his life here. all the best, Anne-Marie K.
Well my first show ever is now under my belt (Wow what a blast). Because I was very nervous and have never shown a horse before, I enter Pirmin in WT A and WT B, more than enough for me for the first time. We had so much fun I can't wait for next year. We did very well WT A we took first place with a score of 80.47 and in WT B we took second place (because I mess up not wonderful Pirmin) with a score of 76.19. What a confidents boost that was for me. So of course next year it well have to be Training Level 1 . 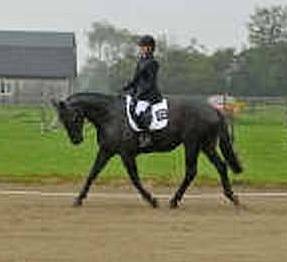 I'm not to good at getting Pirmin to Canter to the left (any tips). 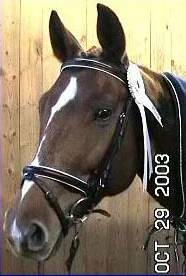 I want to thank you for such a Wonderful horse he is so great I just love him. He is everything you said a gentleman and takes real good care of me, and of course me of him. Here is a small pic I have of us. My Toyah baby girl is amazing! We went to our first "fun" show at Hoof Beats Dressage Club in Melbourne. She was soooo my horse.Henry was the groom. She just loves Henry. He is so good with her. She was in season and I was not sure how she would be. I was not the least bit nervous. I was so proud. We had to warm up in a paddock, the ground was uneven and there were horses in the other paddocks. She just paid attention to me. I could not stop giggling and smiling. My face hurt at the end of the day. I know I had a huge smile throughout our tests. We experienced so many new things that day she needed to trust me even more. The arena was really dark so entering it for some of the horses was a problem. Not my girl, a little scratch on her withers and off we went. We got in the high 50's for our tests. They were not important it was just getting there that was the accomplishment. Everyone loved her loved her. ... I highly doubt I will ever buy another horse from anyone but you, so I hope you stay in the breeding business for another 10 years or so. I just don't trust anyone else. The quality is usually not there, or if there's quality the price is completely ridiculous. Or the training has been crap, or there's dishonesty involved etc etc. It crossed my mind that maybe I won't want to quit riding in my mid-60s when William will be slowing down. I might need to start another one in 10 yrs or so. ... 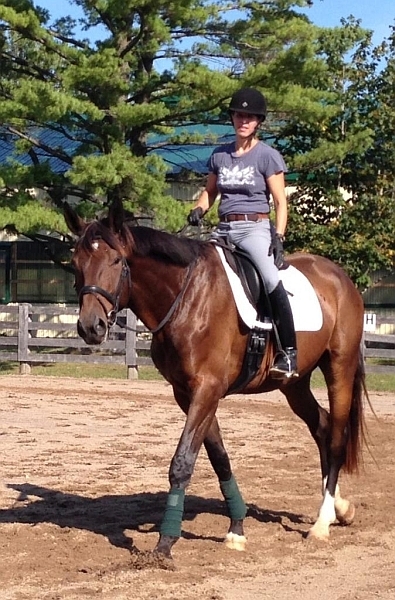 I would expect my energy will be waning by my mid-70s and that future horse and I can just get old together. In all seriousness, William is truly an amazing horse and I am extremely proud of him and so grateful to have him as my partner. You did such a good job making him and bringing him up. I'm very lucky.